RED is made for real red wine enthusiasts, a mouthfilling peppery Shiraz wine with a component of Durif. 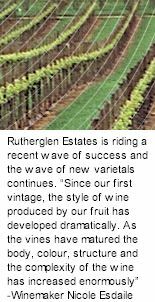 Rutherglen has the soils and climate to ripen fruit evenly and completely, allowing the development of engrossing complexities. Rutherglen is in a declared phylloxera quarantine, which means all the grapes grown within the region have to be vinified locally, itself a guarantee of quality. Crafted to encourage the development of bright, fresh berry flavours and juicy tannins which complement the complexity of exciting barrel ferment characters. In true Rutherglen style, a wonderful depth of colour, to state the obvious - it is RED! Fine aromas, peppery, berries and brambles, intense spice. Palate follows through with the pepper and spice of Rutherglen Shiraz and a background of rich Durif, which contributes the blackberry fruit, licorice, aniseed and chocolate characters, as well as firming the tannins for a complete red wine.